im just hoping im not destroying anything in the engine. I'm not sure if the fly wheel shows the retarded and advanced positions. You can probably borrow a timing light for FREE from Autozone...etc. And you wont have to HOPE. Yes it shows Full advance marks. 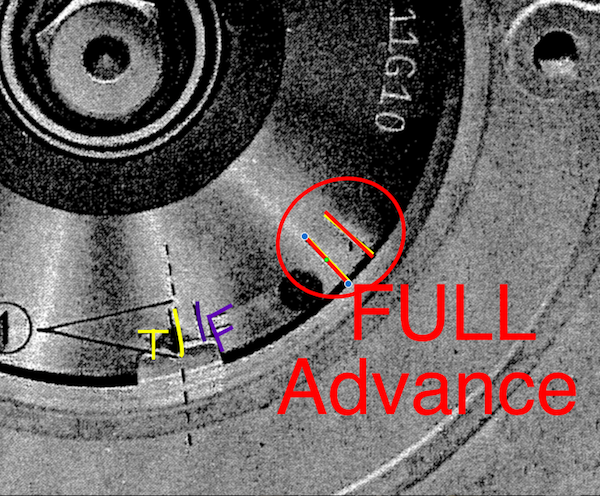 At full advance (it should start to advance around 1500rpm and full advance closer to 3500rpm, give or take) it should fire anywhere twixed the two advance marks. Im sure that by sheer chance you got it really close to being timed. But yes look for the reason its not lining up closer to the mark and you may uncover more power than you got now.